This Pressure Cooker Beef and Butternut Squash Stew is an easy weeknight meal that your whole family will love! it’s gluten free, paleo and whole30. 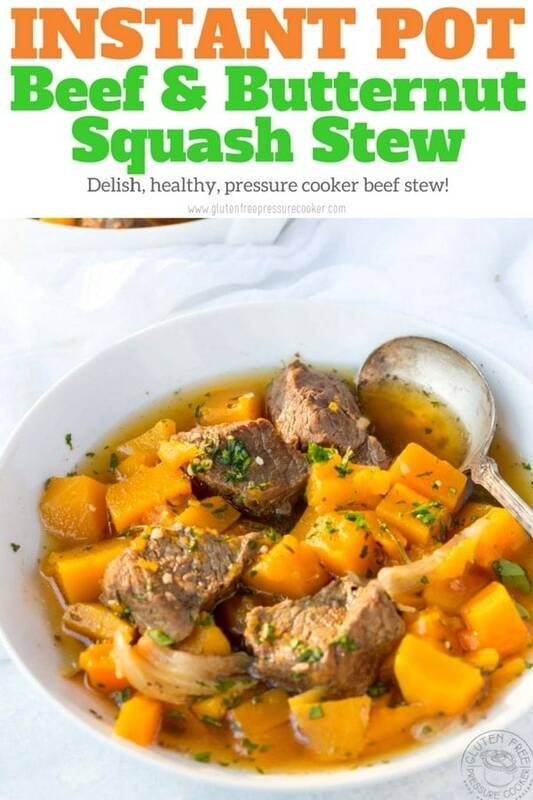 I’ve been making my Instant Pot Beef and Butternut Stew for years in the slow cooker but now I have a pressure cooker version that tastes just as nice and cooks in a fraction of the time. I’ve been making this recipe for a long time and thought it would be a great recipe to try in my Instant pot, so I’ve tweaked it a little and adjusted the cook times to make it work in a pressure cooker. 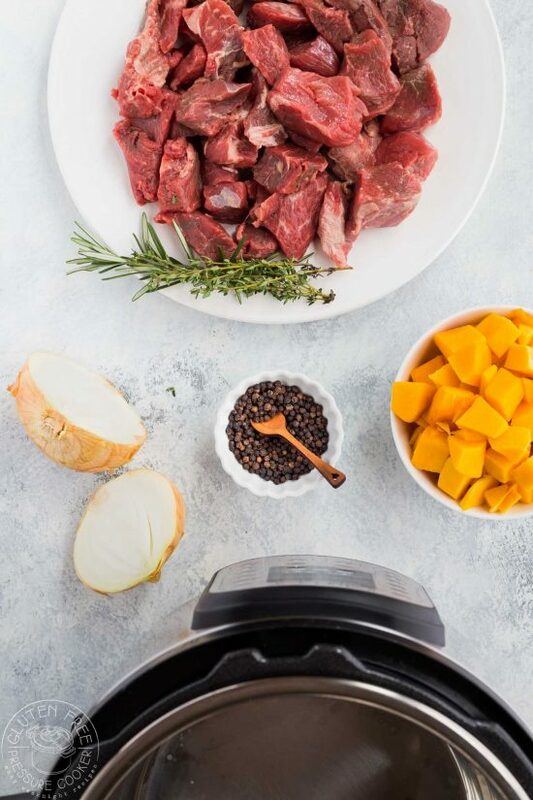 I recommend you sear the beef in your Instant Pot or other electric pressure cooker before you add the other ingredients. If you can find fresh herbs that will work the best, I don’t think you’ll get the same flavor boost with dried herbs. 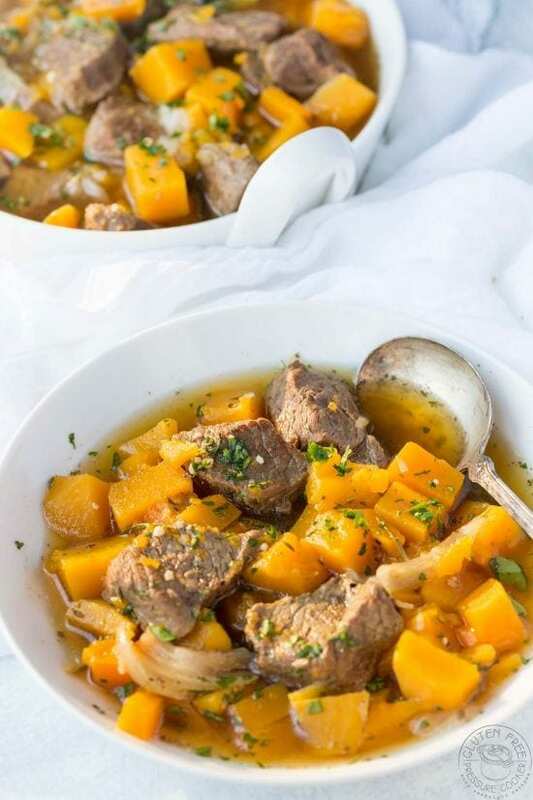 You’ll need an electric pressure cooker for this recipe, I prefer the Instant Pot as it has a stainless steel pot rather than one with a non stick lining. The timings for all my recipes are for an electric pressure cooker, but if you have a stove top pressure cooker you will probably need to adjust the cook time down a little as the pressure is more with a stovetop. I highly recommend choosing one of the Instant Pot brand of pressure cookers, I have two of them! I have two six quart Instant Pot Duo Pressure cookers. I also have a helpful post that lists my top ten Instant Pot accessories so make sure you take a look at that too! NOTE: If you are following Paleo or Whole30 you can use water if you don't have homemade beef broth, it won't be quite as rich but still very good. Prepare the squash by peeling it, removing the seeds and cutting it into large cubes. Turn on the saute function on your electric pressure cooker and adjust to the medium heat option. don't wait for the display to say 'hot' add oil right away. After about a minute add the beef pieces and brown a little on each side. You may need to do this in batches so you don't crowd the pot. With the beef removed, add the onion and garlic to the pot (add a little more oil if you need to) and soften for a few minutes. 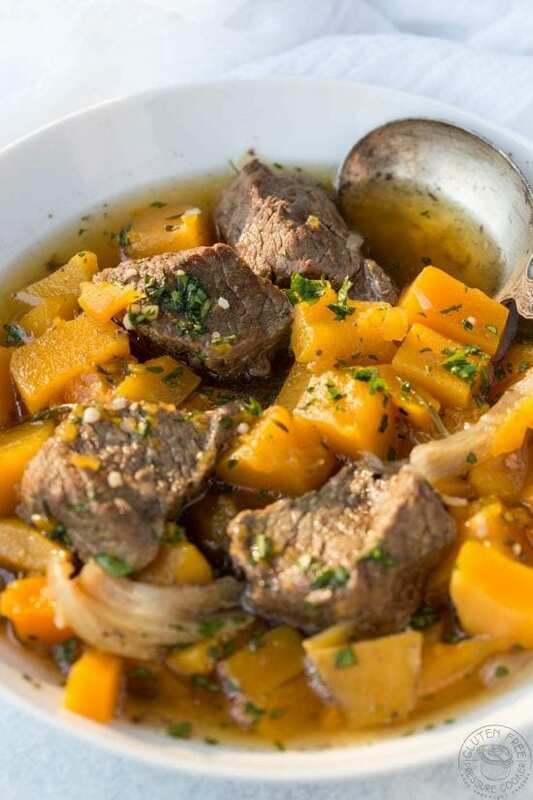 Add the beef stock or water to the pot, then add back the beef, butternut squash, herbs, salt and pepper. 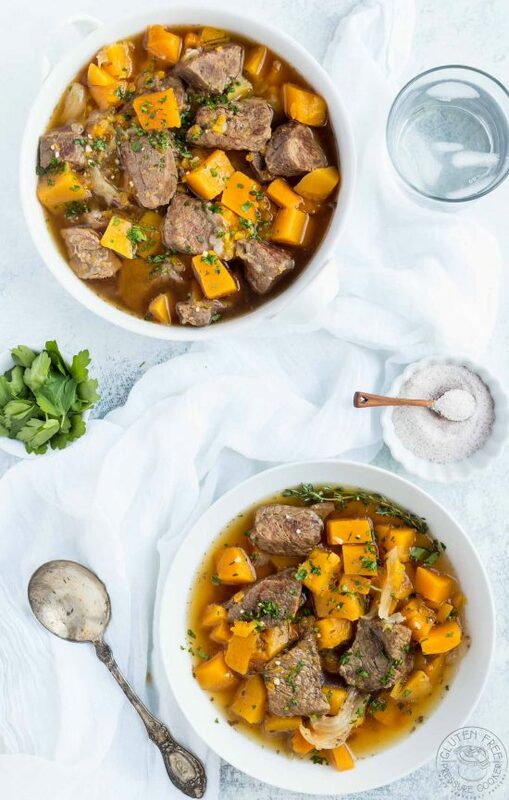 I have found it hard to find store bought paleo or whole30 beef broth for this recipe so you would need to use homemade beef broth, or you could just use water as an alternative, it won't be quite as rich but it will work. I love that this is whole30, and it looks easy to make even for me! Hi Daria, It’s super easy to make, I hope you like it and good luck with Whole30! I tried this recipe today. And do you rinse the meat after sauteing to get the excess fat off. When I cooked it, the broth was pretty much emulsfied fat. I don’t rinse the meat, that would remove all the flavor. If you think you have excess fat on the meat I’d cut it off before you cook it. This was delicious!!! The only change I will make the next time I make it (and there will be a next time!) is to salt the beef before I brown it. Other than that, it was great! This turned out to be PERFECT! So delicious. All my kids gobbled it up. Definitely making again! i’ve been trying to find an instant pot “steak” chili recipe, but haven’t had much luck. this looks delish as is, but i’m going to adapt for my chili! can’t wait to try both! pinning this & others… thank you!